1. Fancy drinks from Japonais. Edible orchid that I did not indulge in lol. Yellowtail sashimi was soo good, devoured it like asap when it came! 2. Infamous glass flowers at the Bellagio. 3. I Love Love Jeff Koon's sculptures!! So I was soo freaking happy to see this. :) Its so whimsy, so tangy.. and soo me, in the color choices lol! 4. Statue of Jellibertyy.. haha, that didn't work the way I wanted. But its a statue of liberty made of jellybeans.. it was cool! haha. 5. I found LOVE in the M&M store! <3 6. Fancypants M&M all dressed upp, It was funn, and the little munchkin loved it! 7. I got to watch La Reve, my first ever Vegas show, I could not take pictures because I was just totally enthralled by all the action & acrobatics, the stage was beautiful. The plot was a little confusing, but otherwise it was an ah-mazing experience. 8. Hit up the pool with my sisterr, C, I actually got a tan, and I want more sunn.. which is surprising since I'm usually pale as anything. 9. What are these random tacos doing in this post?! Soo umm the first day we were in Vegas, I ate 7.5 tacos.. that's like a lot for me, and cause they was so deliciousos. We randomly stumbled into TJ's Taco Bar for four meals.. lol! Most nommy tacos, Definitely a must eat when you go, esp with a cold ice one. so good! 10. 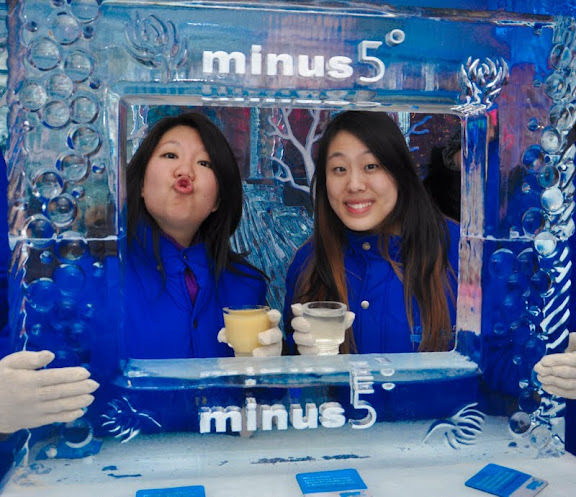 The minus 5 ice bar with my sister, J. It was pretty cold. lol. Everything was made of ice including our cups, and it was fer sure an experience!! I love Vegas too! I went a couple of years ago on spring break and I've been dying to go back since! Fun! We are heading to Vegas in a few months. My hubby has never been. You have given me some ideas of where to take him.